Signorile On Grenell's Resignation - Joe.My.God. Actually, I believe this is a big win for progressives and for gay journalists and commentators as well. 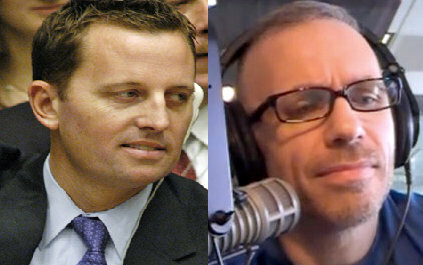 We drew out the conservative leaders in addition to Fischer, like Family Research Council’s Tony Perkins, Gary Bauer and other commentators on National Review and Daily Caller, by bringing forth and continually highlighting the true facts about Grenell, which, to most Americans, are completely acceptable, but which, in the eyes of the evangelical right, make him a radical homosexual. As I wrote in a post last week, Grenell isn’t just gay, like some other gay Republicans who stay quiet about their homosexuality. He’s a gay man who very publicly expressed that he wants to get married to another man and who believes President Obama isn’t adequate on LGBT rights. Why is it this a win? Because Grenell was being used for cover by a candidate with abhorrently anti-gay positions, a man who has promised to “propose and promote” a federal marriage amendment if elected president. I don’t buy the argument made by some that it was a measure of progress that Romney hired a gay man as his foreign policy spokesperson when he’s using that gay man to make himself appear moderate to independents while he’s promising the GOP base that he’ll make gay people into second class citizens. Actual progress in the GOP will come when their presidential candidates stop bowing to bigots and refuse to sign their extremist pledges. Otherwise, it’s all window dressing.